TUCSON, Ariz.—As the date nears for Trump to declare a national emergency if he doesn’t get the funding he wants for his Border Wall, there is resistance happening on many fronts here in the Borderlands. In southern Arizona, asylum seekers arrive in the hundreds every week, and the Tucson community has stepped up in big ways to welcome them, including the opening of the old Benedictine Monastery to shelter them. Similar efforts are also happening in Phoenix, El Paso, Texas, and Las Cruces, New Mexico. Arizona groups such as the Latinx/Chicanx organization Mijente and broad coalitions like the Southern Border Communities Coalition are traveling to Washington, D.C. this week to meet with the 17 members of the House-Senate Conference Committee charged with preparing a report to Congress by Friday, February 8, and to advocate against any funding for a border wall or increased militarization of the border. Civil society groups in Mexico are also organizing and speaking out to advocate against their national government allowing U.S. asylum seekers to be returned to Mexico (under the Department of Homeland Security’s so-called “Migrant Protection Protocols”) to await their court proceedings in the asylum process. Organizations such as the ACLU and Human Rights First are weighing legal challenges to this unprecedented action by the United States government, which constitutes a violation of international conventions. The Migrant Protection Protocols are expected to be expanded from Tijuana all along the southern border. 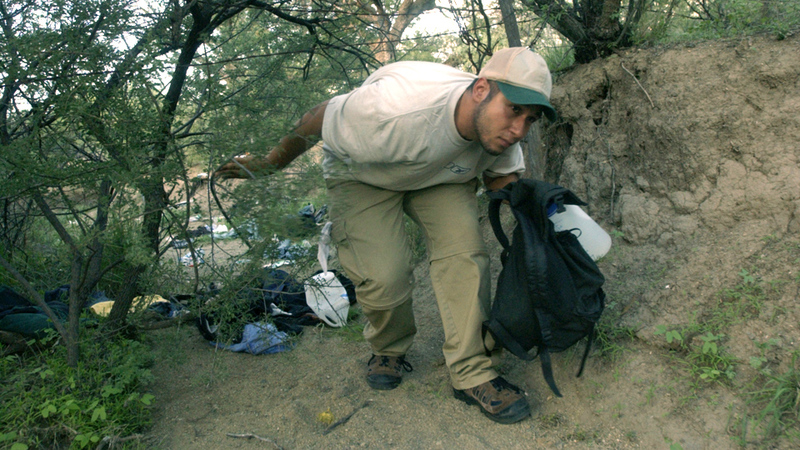 Without access to the asylum process once they are pushed back across the Mexican border, there will be more deaths in the desert as those made to wait or sent back to wait try to get to safety. And more prosecutions of humanitarian aid workers are likely to be seen as well. In Tucson federal court on January 18, four No More Deaths volunteers were found guilty of entering the Cabeza Prieta Wildlife Refuge without a permit and leaving property. The “property” they left? Life-saving water for migrants. Sentencing is expected March 1. The public is asked to sign onto a petition which supports humanitarian aid and opposes criminal prosecutions of such humanitarian aid volunteers. 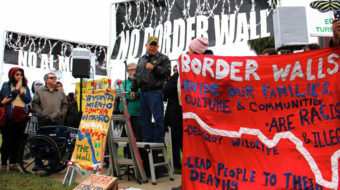 Native American resistance to the border wall is happening now in the form of a camp in the Rio Grande Valley, set up by members of the Carrizo/Comecrudo Tribe of Texas. The Morillo tract of the Lower Rio Grande National Wildlife Refuge is where wall construction is expected to start any day. The Rio Bravo Action Camp—four days of direct action training organized by a group of dedicated land and water protectors, and primarily for indigenous and people of color—is planned for mid-February. The Tucson-based Center for Biological Diversity is joining activists in El Paso, including the Border Network for Human Rights, in protesting the border wall already under construction there. The contractor, West Point Contractors of Tucson, is building four miles of border wall near the city. The Center has drafted a letter to the City of Tucson asking it to deny any further contracts with West Point, in compliance with their stated policy to not do business with companies involved in building a physical border wall. TOHRN (Tohono O’odham Hemajkam Rights Network)—an O’odham-led movement of young people who care about their land, their rights, and their future—has been documenting border patrol abuses occurring on Tohono O’odham land for several years, and taking a stand against the border wall. The Tohono O’odham Nation’s lands have been divided between the U.S. and Mexico for more than a century and a half, and the Trump “wall” threatens to make it even harder for them to cross that boundary to visit relatives or for other reasons. All these groups and coalitions in the Borderlands—in the U.S., in Mexico, and across the Tohono O’odham Nation—are ramping up the resistance to bring in more people to stop Trump’s wall. With the president’s declaration of a national emergency possible any day, their work is more essential than ever.